Pamela Bone has written an excellent column titled Muslim sisters need our help and she laments the silence among Western Feminists regarding the oppression of women in Muslim countries. In Tehran in June, several thousand people held a peaceful demonstration calling for legal changes that would give a woman's testimony in court equal value to a man's. The demonstrators, most of them women, were attacked with tear gas and beaten with batons by men and women from Iran's State Security Forces, according to Amnesty International. Iranian women may not travel without their husband's permission but they are allowed to wield a truncheon against other women. Pamela Bone also takes aim at the lack of opposition towards the establishment of reactionary Islamic laws in Canada. Feminism is not quite dead, however. The execution of Kolhari was stopped after a petition gathered thousands of signatures from human rights activists in Iran and across the world, including more than 5000 from the Feminist Majority Foundation in the US. Yet in Canada it took an Iranian exile, Homa Arjomand, to lead the fight to stop sharia courts being established there; she did so with almost zero support from Anglo-Canadian feminists and academics. Named Canadian Humanist of the Year, she's now running a campaign to stop honor killings. In Canada? "In Canada we are not witnessing honor killing much simply because in Canada women and young girls who are not submissive are taken to their home countries such as India, Pakistan, Afghanistan or Nigeria, and there they are being murdered by the male member of the family or a hit man," Arjomand said in a speech earlier this year. "And the (Canadian) state is not obligated to protect the individual citizens who were forced to leave Canada by the head of the family." Let's hear it for right-wingers! If the only people willing to call multiculturalist, moral relativist nonsense bunk are right-wingers, let's hope that the Western world turns solidly right-wing in a nanosecond. Peter Galbraith has written a book titled "The End of Iraq," which is likely to influence many liberal American politicians and perhaps a few conservatives. Reidar Visser is a research fellow at the Norwegian Institute of International Affairs and editor of the website http://historiae.org. Reidar Visser argues against the main thesis of Galbraith's book, which is that Iraq must be divided into at least three smaller nations. With the exception of the author’s claim that, in their inner conscience, leading Kurdish politicians are not in favor of Iraqi unity (p. 99), much of the remainder of his argument for partition is either based on the increasing levels of political violence more generally, or not related to Iraq at all. The idea of coexistence in Iraq is “absurd” charges Galbraith on pp. 100–101. The decisive proof? Yugoslavia and Czechoslovakia and the Soviet Union all fell apart. But what about other possible comparisons, such as Lebanon – which descended into ethno-religious mayhem and saw extensive internal displacement of its population from 1975 to 1990, only to rise again as a unitary “mosaic”-like state? Today’s sectarian violence in Baghdad is certainly reminiscent of Beirut during the Lebanese civil war, where talk of partition and confederations materialized in some circles at particularly gloomy junctures, only to dissipate later on. And what is Galbraith’s position on the large numbers of other “artificial”, post-colonial, multi-ethnic states worldwide that somehow continue to function? Galbraith seems to have scant interest in such examples of ethno-religious coexistence and reconciliation; instead he mocks anyone who shows interest in keeping Iraq unified. He roundly condemns the Bush administration for the heinous crime of trying to secure a “non-ethnic Iraq” (p. 166) and castigates them for speaking of an “Iraqi people, as if there were a single people akin to the French or even the American people” (p. 83). But he fails to provide any historically convincing justification for his own quantum leap from diagnosing a state of civil strife to prescribing territorial, segregationist solutions. That lack of historical perspective is a serious problem, because it precludes the writer from distinguishing between societies that are chronically unstable and those that experience a serious but reversible flare-up of civic violence. It should serve as a reminder to Galbraith that his claims about Kurdish leader’s anti-Iraq attitudes cannot possibly be repeated with regard to Sunni and Shiite elites, and that, despite the ongoing horrific violence, large masses of Iraqis, certainly in the Arab areas, continue to demand a “national Iraqi” army, a “national Iraqi” oil distribution policy, and a meaningful role for Baghdad as capital. I do not believe that the Bush administration should encourage the division of Iraq. Since Iraq's oil reserves were not equally distributed by nature over all of Iraq's territory, any discussion of dividing Iraq would have to deal with the inevitable cries of those who would lose access to oil reserves. Also, since the Iraqi Kurds have already gone a long way towards establishing a civil society, keeping Iraq together is likely to have the positive affect of moving the rest of Iraq in the Kurdish direction. Amir Taheri writes that many Arabs believe that Hezbollah didn't win the recent conflict with Israel. It's worth reading the entire column, but here are some excerpts. Mona Fayed, a prominent Shiite academic in Beirut, wrote an article also published by An-Nahar last week. She asks: Who is a Shiite in Lebanon today? She provides a sarcastic answer: A Shiite is he who takes his instructions from Iran, terrorizes fellow believers into silence, and leads the nation into catastrophe without consulting anyone. Another academic, Zubair Abboud, writing in Elaph, a popular Arabic-language online newspaper, attacks Hezbollah as "one of the worst things to happen to Arabs in a long time." He accuses Mr. Nasrallah of risking Lebanon's existence in the service of Iran's regional ambitions. There was a time when Shiites represented an underclass of dirt-poor peasants in the south and lumpen elements in Beirut. Over the past 30 years, however, that picture has changed. Money sent from Shiite immigrants in West Africa (where they dominate the diamond trade), and in the U.S. (especially Michigan), has helped create a prosperous middle class of Shiites more interested in the good life than martyrdom à la Imam Hussain. This new Shiite bourgeoisie dreams of a place in the mainstream of Lebanese politics and hopes to use the community's demographic advantage as a springboard for national leadership. Hezbollah, unless it ceases to be an instrument of Iranian policies, cannot realize that dream. The list of names of those who never endorsed Hezbollah, or who broke with it after its Iranian connections became too apparent, reads like a Who's Who of Lebanese Shiism. It includes, apart from the al-Amins, families such as the al-As'ad, the Osseiran, the al-Khalil, the Hamadah, the Murtadha, the Sharafeddin, the Fadhlallah, the Mussawis, the Hussainis, the Shamsuddin and the Ata'allahs. Having lost more than 500 of its fighters, and with almost all of its medium-range missiles destroyed, Hezbollah may find it hard to sustain its claim of victory. "Hezbollah won the propaganda war because many in the West wanted it to win as a means of settling score with the United States," says Egyptian columnist Ali al-Ibrahim. "But the Arabs have become wise enough to know TV victory from real victory." I hate to toot my own horn. 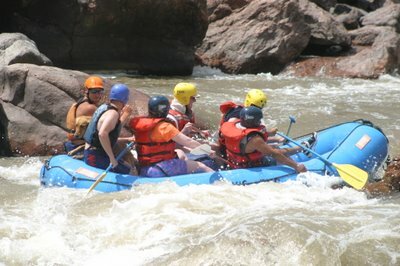 But a month ago my wife and I planned to go whitewater rafting on the Arkansas River in Colorado on the 21st of August. Then we heard about the possiblity of a terrorist attack sometime around the 22nd of August. Did we cancel our rafting trip? Of course not. I told my wife, "If we cancel this rafting trip due to concerns about suicide rafters hijacking our raft, the terrorists will have won." My wife and I were lucky. 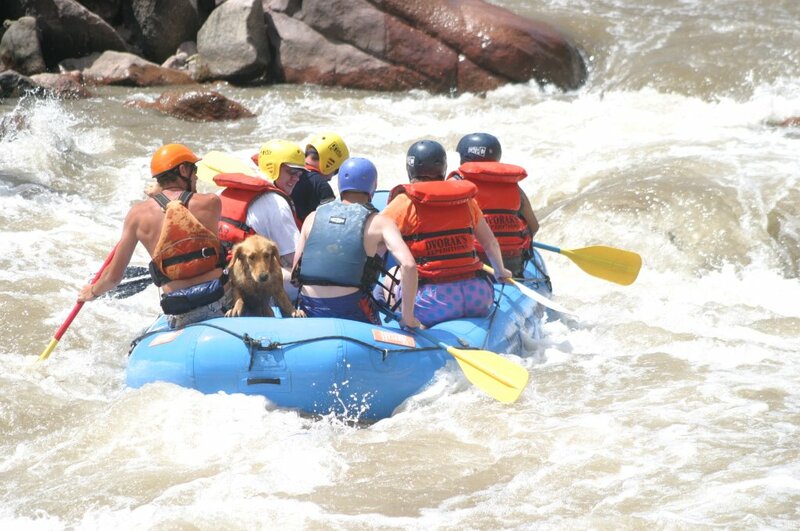 The rafting company took the extra precaution of adding a Raft Marshall. Notice how he is looking back while the rest of us are looking forward. Excellent training they get, don't you think? This way they can spot a suicide raft approaching from behind. And not a single terrorist attack during our entire vacation. 'CANVAS', the smallest of the two state-funded television stations in Flanders, the northern, Dutch-speaking part of Belgium, today, in prime time, aired 30 minutes of the Internet-video "Loose change", 'showing' how the Bush administration and not Osama Bin Laden was behind 9/11. No context was given. Only a short introduction. And tomorrow they are going to show a documentary about French writer Thierry Meyssan who earned a fortune on the corpses of 3,000 people with a book on the same conspiracy theory. It is a disgrace and an outrage that my taxes are used to finance an institution which spreads this type of utter nonsense. They have no ethics, no morals, no sense of responsibility. Because, what message does this convey? That the war against islamofascism is only a product of Bush's imagination or, even worse, his design? Do the facts, the many (foiled) terrorist attacks around the world, not matter at all anymore? I feel ashamed for my own 'countrymen'.